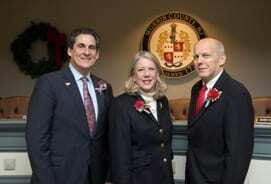 Morris County Freeholders Deborah Smith of Denville and John Krickus, of Washington Township, and County Clerk Ann Grossi of Parsippany were sworn into office for second terms, while former Mountain Lakes Mayor Stephen Shaw took the oath of office this evening for his first term on the Morris County Board of Freeholders. At county government’s 2019 Annual Meeting held in Morristown, Freeholder Doug Cabana also was selected by his peers for a third consecutive term as director of the board, while Freeholder Heather Darling was chosen as deputy director. Showing their support for those who took the oaths tonight were a host of political dignitaries, including state Sens. Kristen Corrado, Tom Kean and Joe Pennacchio; Assemblymen Anthony Bucco, Michael Patrick Carroll, BettyLou DeCroce, and Christopher DePhillips. 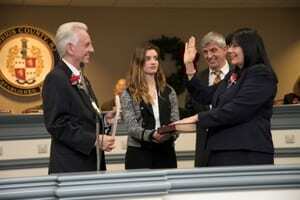 Also on hand was former Freeholder Christine Myers, who declined to seek re-election last year, former Freeholder John Inglesino, and former Freeholder and longtime Morris Plains Mayor Frank Druetzler, who ended more than four decades as mayor on Jan. 1. “It is an honor for me, and a privilege I take very seriously, to have been chosen again by my colleagues as freeholder director,” said Freeholder Cabana, who hails from Boonton Township and is the longest serving member of the county governing board, starting in 1997. Continuing to preserve the county’s top-ranked Triple A bond rating, and maintain the county’s prudent and responsible financing and budgeting. Continuing to make the safety of our residents a priority by providing the best-educated, trained, and equipped police, fire, EMS and first response services across our county. Working to ensure a positive environment for our business community, by helping to ensure they have a well-trained workforce that will keep our companies and jobs here in Morris County. Working closely with our 39 municipalities on shared services, and incorporating the goals developed in the county’s new Strategic Plan into our county-municipalities’ relationship. A past president of the New Jersey Association of Counties, it was under his leadership in 2006 that the association became an initial driving force behind the now popular concept of “shared services.” Cabana will continue in 2019 as Morris County’s representative to that statewide association, a role he has held since 1999. Some specific projects to be addressed by the county in 2019 include starting up the county’s new Navigating Hope mobile social services operation, building a new $10 million County College of Morris engineering and manufacturing facility, starting work on the new 4.4-mile Pequannock-to-Wayne Recreational Trail, continuing and expanding special training program on school violence for law enforcement and educators. He also spoke of the need to deal with the infestation of the county’s ash trees by a tree-killing insect, and pursuing the county’s petition to the U.S. Supreme Court to allow historic houses of worship to participate in the county’s historic preservation program. Also, he said the board in 2019 will take key steps to consider long-term judicial space needs at the county court and government complex in Morristown. He noted that a special information session for the public will be held next Wednesday evening, Jan. 9, in Morristown.